Dog lovers spend plenty of time petting pooches at the park and in the street without getting paid. Then they're dropping extra money getting that fancy dog stroller and the studded pink dog collar for their own best friend. It's almost impossible to imagine that you'd actually get paid to give all that love to some charming pups. 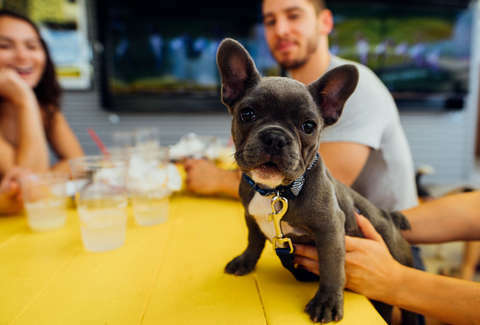 MUTTS Canine Cantina, a dog-friendly restaurant and dog park in Dallas and Fort Worth, has announced plans for its first-ever fall internship. The job will be given to a person lovingly referred to as the Puptern. Their job will be to greet MUTTS members and offer to show their dogs some love. Even better, the Puptern is going to earn $100 per hour. Oh, and the Puptern will get some good grub from the MUTTS restaurant. "We are looking forward to hiring our first ever Puptern," Kyle Noonan, co-founder of MUTTS, said in a statement. "There aren’t many opportunities out there that pay interns to strictly play with dogs all day long. Typically, there may be other responsibilities that come with the job, but not this one. I'd be lying if I said this is going to be one 'ruff' internship." It'd be more than fair to think this is too good to be true, but a MUTTS representative says it's real as a Neopolitan Mastiff. The details of the intern's hours will be worked out with whoever gets the gig. However, the representative tells Thrillist that the intern will work up to four hours per week for six-to-eight weeks through the fall and winter. Four hours isn't much, but $400 for four hours of petting good dogs is awfully appealing.